Apparently, there's a 50-50 chance that all the sea ice at the North Pole will melt by the end of this summer. On the upside, I can finally fulfill my dream of paddleboating from Alaska to Norway. Again, most of the fundamentals of the race favor Obama. The economy is weak on the Republicans' watch, Bush is highly unpopular, the Republicans have held the White House for two terms, there's an unpopular war going on, etc. But McCain is widely perceived as far more moderate than Obama. I'm curious to what extent this will change between now and November. Non-nerds needn't read this post. Actually, if you aren't a nerd, why are you reading my blog at all? If you, like me, are still stumped over the implications of the "Galactica" mid-season finale, this thoughtful post reminds us that the original 1978 "Galactica" series may hold the key. Oops. The Colorado delegation to the Democratic convention has one extra male. They'll need to swap one at-large male delegate with a female at-large alternate. I keep hearing debates about what exactly the Clinton/Obama split in the Democratic Party means. Yes, they're close on policy issues, but the split is occasionally framed as a larger division over party strategy, in which the Clinton team includes the Carville/Emanuel strategic types (who target a few key states and flood them with money) and the Obama team is aligned with the Howard Dean 50-state folks. Here's some more evidence on that split: Obama has decided to campaign separately from the Colorado Coordinated Campaign. This seems to have pissed off some party regulars, like the Clinton-backing Paul Sandoval, a north Denver restaurateur and pretty significant local party leader. I don't see this as a huge story -- there's always tension between a presidential campaign and the coordinated campaign, and the Post story linked to above correctly notes that it's of a piece with Obama's decision to reject public financing. That is, he's doing pretty well on his own. I certainly can't speak for Mr. Sandoval, but his argument might make sense if you equated Clinton with the older insider Party structure and saw Obama's team as the new interlopers. Then the argument becomes, "Sure, you did it with all these outsiders, but then don't expect the Party regulars to turn the keys of the machine over to you." It would still be a deeply flawed argument that ignores the full range of support that Obama enjoys, but I can see how someone might try and make it. "There's only one thing different about Barack Obama when it comes to being a Democratic presidential candidate. He's half African-American," Nader said. "Whether that will make any difference, I don't know. I haven't heard him have a strong crackdown on economic exploitation in the ghettos. Payday loans, predatory lending, asbestos, lead. What's keeping him from doing that? Is it because he wants to talk white? He doesn't want to appear like Jesse Jackson? We'll see all that play out in the next few months and if he gets elected afterwards." That is a brilliant term, used to describe legislation that will clearly have the opposite effect of what is intended. Henry Farrell provides a perfect example: a Senate bill that would tax visitors to the U.S. to pay for promotional materials to encourage people to visit the U.S.
How did you campaign? Why do you think you were picked? My friends and I prayed. I printed up fliers citing experience and recommendations from friends, and I stuffed them into the delegates' tote bags prior to the state convention. As for why I was picked, it could be part of God's plan, or could be that my qualifications and political viewpoints as listed on the flier were convincing. Dream ticket: Tom Tancredo and Jesus Christ. Tom could do the hard, controversial work and Jesus could inspire the populace to work toward something bigger than themselves. There's hubris, and then there's believing that it is God's great plan for you to become a delegate to the Republican National Convention. It's hard to believe that God wants certain teams to win football games instead of other teams, and it's really hard to believe that God wants you to go to Minneapolis to cast a vote for a race that has already been decided. Hopefully God is a little busier than that. And as for the dream ticket, is the idea that Christ would be Tancredo's vice president? Would He be okay with that arrangement? And if Christ is on the ticket, what exactly does Tancredo bring to the table? It sounds like that arrangement in "Last Temptation" where Jesus asked Judas (the film's hero) to do the really hard stuff, like turn him in to the Romans. But I doubt that's what our delegate was going for. Do African American candidates face a vote "penalty" when they run statewide? This seems like a particularly relevant question this year as we try to figure out what's going to happen in the presidential election. There's an assumption out there that a fair chunk of white voters simply will not support a black candidate. On the other hand, in his examination of U.S. House races, Ben Highton found little evidence that white voter racism was keeping African Americans from winning office. So which is it? I was discussing this with some friends recently and was finally cajoled into collecting the data and looking at it. Statewide elections, as opposed to House district elections, seem like the appropriate place to study this, since the presidential election is essentially just 50 statewide elections. The main problem with this sort of study is the very small number of African American major party nominees for state office. I collected election results from all the U.S. Senate and gubernatorial elections conducted in 2002, 2004, and 2006. In these 181 contests, there were only 10 African American major party candidates: 5 Democrats, 5 Republicans. Even worse, I had to throw out two of those cases -- Barack Obama and Alan Keyes, who ran against each other in the 2004 Senate race in Illinois. Presumably, any African American "penalty" would have been cancelled out in that election. I found no statistically significant race effect. The effect I measured is, in fact, negative, but it's less than two points and has a t-score of -.47. This means either that blacks aren't systematically punished in statewide elections (yay!) or that I haven't gathered enough data (boo!). But I'm not sure how valuable additional data-gathering would be -- there just aren't that many African American statewide candidates going back into the 1990s, and even if an effect did turn up then, one could argue that it no longer exists. In only one of these cases (Ford) did the African American candidate lose where he "should" have won. So what does this mean? It might mean nothing. Then again, if we had more data, we might find that this modest vote penalty is real. Which would mean that McCain has a one-to-two-point advantage going into the November election just based on race. I imagine Obama is planning to win by more than that anyway, but it's something to consider. Thanks for checking in, Hagel. Republican Sen. Chuck Hagel said Friday he would consider serving as Democratic presidential candidate Barack Obama's running mate if asked, but he doesn't expect to be on any ticket. Thanks, Chuck! Let me just state at this point that I don't expect to be on a ticket, either, but if asked, I'd consider being Obama's running mate. Like Barack, I have one of those great, only-in-America life stories. My father was a white Jew from New York, and -- get this -- my mother was a white Jew from New Jersey. That's just insane! My one reservation is that I have to put together my tenure file next year, and my responsibilities as vice president might interfere with that. Then again, they probably wouldn't. Sorry for the light posting. Conferences, book stuff, etc. I'll be back soon. We visited Montreal in mid-June. It's quite unlike other cities I've visited. We stayed in the Vieux Montreal neighborhood, the old part of the city. The city as a whole has a very modern vibe, with a thriving foodie culture, but it also has a real sense of its history, with wonderfully preserved older buildings peppering the downtown area. What really struck me about the place was the bilingualism. Most people to whom I spoke addressed me first in French. When they realized I couldn't speak French worth a damn, they switched seamlessly into an accentless English. A couple next to us at dinner switched back and forth between English and French throughout their meal. I've seen this sort of thing among some of my Spanish-speaking students, and I know it's actually pretty common in many countries, but to my limited American worldview, it was pretty impressive. Also impressive was the food. The residents of Montreal really like meat, to the point that they make Coloradans looks like a bunch of tempe-sucking fruititarians. We had one of the best dinners of our lives at Garde Manger. A simple salad, consisting of thinly-shaved vegetables with an apple vinaigrette, was remarkably tasty. My main course was bavette et frites -- a medium-rare flank steak served with steak fries. It's hard to explain how something that sounds so simple could taste so damned good. They have a number of excellent fish items on the menu, as well, and we tried the trout, which was phenomenal. What won me over to Obama's side? Sadly, it may have something to do with his liberal use of movie quotes to explain politics. As I mentioned previously, when he visited the University of Denver campus and it turned out his audience was too big for the venue, he remarked, "We're gonna need a bigger boat," borrowing a line from Roy Scheider in Jaws. Yesterday, Obama explained his willingness to be tough on John McCain by paraphrasing Sean Connery in The Untouchables: "If they bring a knife to the fight, we bring a gun." You wanna know how you do it? Here's how, they pull a knife, you pull a gun. He sends one of yours to the hospital, you send one of his to the morgue. That's the Chicago way. I understand Obama's a big fan of The Godfather. This campaign's gonna be fun. 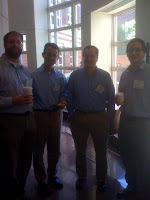 I showed up at a conference on social networks analysis yesterday and ran into Hans Noel, Greg Koger, and Nils Ringe. We were all wearing the same uniform. Sometimes coordination just doesn't require conspiring. Let us dedicate ourselves to what the Greeks wrote so many years ago: to tame the savageness of man and make gentle the life of this world. Let us dedicate ourselves to that, and say a prayer for our country and for our people. Okay, this video compilation from John McCain's Tuesday night address in Louisiana is quite entertaining, and the contrast of his speech with the one Obama delivered shortly thereafter is laughable. But before Dems get too cocky, let's just briefly recall the election of 1952, which pitted a Democratic silver-tongued orator against a gruff, grumbly Republican soldier. Ike beat Stephenson 55-44. Granted, McCain ain't Ike, and there's a world of difference between the political environments of 1952 and 2004 (e.g. 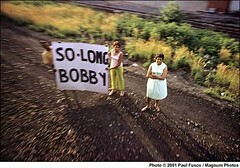 : the unpopular war and the slow economy are occurring on the Republican's watch this time). But my point is that speaking ability, while wonderful if you have it, is pretty modest in its effects on elections. I've had a few interactions with Clinton supporters over the past few days. Some went better than others, but all were rather tense. I've been on the losing end of enough campaigns to know how much that stings, but this one is unusual, partially because of how close it was. In terms of pledged (elected) delegates, Obama beat Clinton 1765.5 to 1639.5. Every contest mattered, as did the superdelegates. This was the closest presidential nominating contest we've seen since the current system of primaries and caucuses was created in the early 1970s. Another way of saying that is that no winner has ever come so close to being the loser, and no loser has ever come so close to being the winner. On top of that, the Clinton folks have plenty to be bitter about. She really did get some crappy and misogynistic coverage in the media, and not just from Chris Matthews. I heard a number of people I respect, including several women, say that they didn't like her because she seemed too "ambitious," which is one of those ridiculous anti-feminist code words. (Just to be clear: Hillary Clinton is ambitious. Barack Obama is ambitious. So's John McCain, John Edwards, and pretty much everyone who's ever thought about becoming president.) This isn't to say the press has been easy on Obama. They were for a while, until he became the frontrunner, and then came all the crap about Rev. Wright and flagpins and attending a madrassa, etc. But the media didn't do Hillary any favors. All this is to say that the Clinton folks are upset, they're hurting, and they're going through various stages of loss. Give them space, give them time, maybe offer a kind word. The party's had worse divisions before. This one will heal. But not overnight. Rep. Marilyn Musgrave (R-CO) is in trouble. So says the Cook Political Report. I saw Musgrave's opponent, Betsy Markey, speak at the state convention. She was impressive. This could be a very entertaining race. This is pretty awesome. H/t Monkey Cage. Not that anyone asked, but here are my thoughts about Obama's pick for vice president. I don't think he should pick Hillary Clinton. Yes, he needs to think about unifying the party after a divisive primary season, and yes, that would do it. But that's not the only thing he needs to think about. He needs to think about winning in November, and I'm not convinced the ticket is any more electable with her on it. Yes, she potentially makes Florida and Arkansas more winnable, but she also galvanizes the right in a way that Obama doesn't -- at least not yet. That said, he should pick someone with close ties to Hillary. Someone whom Hillary and her supporters would deem an ally. In this category I'd put Gov. Ed Rendell (PA) or Gov. Ted Strickland (OH), both governors of key swing states who have been strong backers of Clinton. Such a VP candidate would help bring the party together, make a swing state a bit more winnable, and balance the senator at the top of the ticket with a governor below. Wes Clark wouldn't be a bad choice, either, as he has close ties with the Clintons, potentially puts Arkansas into play (although I doubt it), and gives some military experience to the ticket, which isn't bad going against McCain. I've heard Gov. Kathleen Sebelius mentioned a few times. She's not a Clinton supporter, but I imagine a lot of Democrats would be gratified to see a woman on the ticket. She's quite moderate. Does she put Kansas in play? I doubt it. I was originally excited about the prospect of Sen. Jim Webb (VA) on the ticket, both to shore up military credentials and to help put Virginia in play. But now I'm not so sure. A main concern is that he had some pretty goofy views on women in the armed forces until fairly recently, and he has been terribly dismissive of women complaining of sexual harassment. He may have sincerely changed his views on these issues, but his previous comments would come up frequently in the campaign, and this is not a great way to win over Hillary Clinton's people. I still like the idea of John Edwards, Bill Richardson, or Bill Ritter in the #2 slot, but I'm not sure these guys serve the goals of party unity and ticket electability the way the others do. As for McCain? He probably shouldn't take my advice, but I imagine SEC chair Chris Cox would be a very good choice for VP. He had a great reputation in Congress, and he's an authentic conservative who doesn't sound like a loon. I don't trust Romney, and as much as I love Huckabee, he could be a real trainwreck on the ticket. She had an opportunity to soar and unite. She had a chance to surprise her party and the nation after the day-long denials about expecting any concession and send Obama off on the campaign trail of the general election with the best possible platform. I wrote before how she had a chance for her "Al Gore moment." And if she had done so, the whole country ALL would be talking today about how great she is and give her her due. Let's make no bones about this: it's blackmail. Clinton is trying to pressure Obama. I don't know for what yet, but that's what this is. "Senator? You can have my answer now, if you like. My final offer is this: nothing. Not even the retiring of your campaign debt, which I would appreciate if you would put up personally." I know I'm way too close to this and my bias is obvious, but I really feel like Hillary Clinton had a chance to go out with style tonight. She gave a wonderful speech about her campaign and her career, she praised Obama, she praised her supporters and the many people she met during her campaign. There's been a lot of bad blood between the two campaigns, but this seemed like a rich opportunity to patch some of that up. Obama had already clinched the nomination. She had the attention of the nation and had a chance to bow out gracefully and call for the unity of the party. And instead, she decides not to leave. She hypes her own claims to electability. And she asks people to write in to tell her what to do. There was a moment for her to be a mensch. That moment is gone. That's the message from Andrew Gelman. This may be too high a bar to set for party centered-ness, but it's worth thinking about. 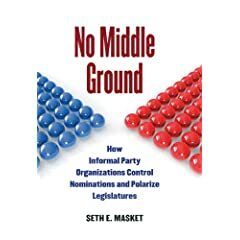 Strong party machines in the 19th century often shifted officeholders around from job to job without real regards for what those officeholders wanted. One thing I learned in econ class in 11th grade was that government policy should be counter-cyclical (spending more in recessions and cutting back in boom times), but that there’s a lot of pressure to be pro-cyclical, which will tend to exacerbate business cycles. (Except I suppose they didn’t say “exacerbate” in 11th grade.) At a personal level, too, it’s natural to spend more when we have more and cut back when we aren’t doing so well. Every now and then you hear about a “rainy day fund” but my general impression is that these are never big enough to counter the business cycle. Political parties seem to apply a similar pro-cyclical behavior in their congressional election campaigns. Consider 2008. It’s expected to be a good year for the Democrats, and so now should be the time for them to make some investments in new, young candidates. They should encourage lots of their incumbents to retire, because in 2008, they can win a lot of these districts without needing the incumbency advantage (estimated to be about 10% of the vote, i.e., enough to take you from 50% to 60%). Conversely, this is the time for the Republican Party to hold on to what it has, and to keep all their incumbents in, trying to hold out until 2010 when the pendulum might swing back in their favor. But we don’t see that—actually, something like 30 Republican House members are retiring this year. Republicans retiring, Democrats sticking around—that’s a recipe for big Democratic gains this year. But then in 2010, or 2014, or whatever year it is when the Democrats get wiped out—then a bunch of their incumbents will probably retire, and boy will the Democrats wished they had put in younger incumbents back in 2008 when they had a chance! One of the difficulties here is that I’m talking about the long-term goals of the parties, but “the parties” are, to a large extent, simply their officeholders. And congressmembers’ incentives can be much different from those of the party as a whole. In particular, it makes sense that an incumbent congressmember will want to quit in a year when he or she would be facing a tough reelection battle, and when the prize for winning is to remain in the minority. Conversely, why step down when you’re facing an easy reelection and the prospect of some juicy committee assignments? So the individual officeholders have an incentive for pro-cyclical behavior, even if it harms their party’s long-term interest. Beyond the benefits or lack thereof to the individual parties, pro-cyclical behavior would seem to increase the size of political changes, making the swings in congressional representation larger than would be expected simply based on swings in public opinion. Actually, many political scientists would consider this a good thing (an increased “swing ratio”); my point here is that some of this swing is “endogenous” in the sense of arising from pro-cyclical decisions of individual congressmembers deciding whether to run for reelection. It would be interesting to see if this happens with state legislatures as well. We also see this in the Senate. For example, 84-year-old Frank Lautenberg is running for reelection in New Jersey. This is a Democratic year when the Democrats might do well with just about anybody. (Or maybe not; I don’t really follow New Jersey politics and am just extrapolating from national polls.) In 6 years, they’re going to need to find someone new, and at that point they might wish they had an incumbent already in the slot. The Democratic race is wrapping up very quickly. The AP was floating stories this morning about Clinton quitting tonight, and then Obama picked up 15 superdelegates today, including Gov. Ritter, Sen. Salazar, and Jimmy Carter. He's now only 27 delegates short of the nomination. How does this affect voters in the final two contests? If it looks like Hillary concession (or, at least, a suspension of her campaign) is just hours away, do they still vote? Do they switch to her in a bout of underdog sympathy? Do they go with the presumed winner? UPDATE: Obama has now picked up 18.5 superdelegate votes and is now 13 delegates shy of the nomination. Tonight's the night. Oh, I guess you do. hardy enough to stand in line, lucky enough to have employment that doesn't require them to work between 6:30 and 8 p.m., and with enough resources -- civic and personal -- to get themselves to a caucus and know what to do there. Hardly a representative sample. I would say that the rewards outweigh the risks. It's the good sort of social capital that Putnam and Etzioni are always talking about and Normal Rockwell loved to paint, without the bad stuff, like Italian fascism. Democrats should probably get a little distance from the current race before they start deciding whether caucuses are good or bad. That said, it's not intuitively obvious ahead of time which candidates will do well in caucuses and which won't. Knowing that the caucus turnout is smaller, more educated, wealthier, and whiter that the primary electorate doesn't necessarily help you predict candidate success. Two years ago, if you knew that the Democratic contest was going to come down to a little known black politician from Chicago and Hillary Clinton, whom would you have guessed would be the caucus favorite? Was there any way to predict that Hillary would somehow be perceived as the gun-totin', beer-drinkin' Scranton girl who doesn't trust them fancy economists, and that her rival, the black Chicago community organizer, would be seen as the East Coast elitist? Also, keep in mind that Hillary Clinton could have done quite a bit better in the caucus states if she'd, you know, campaigned there. One other point: did you notice that the Republican caucuses were largely won by Mitt Romney? Is he really the GOP's Obama? I get that a lot Democratic presidential nominations come down to an insider favorite vs. an egghead (JFK vs. Stephenson in '60, Humphrey vs. RFK/McCarthy in '68, Mondale vs. Hart in '84, Clinton vs. Brown in '92, Gore vs. Bradley in '00, everyone vs. Dean in '04), and that the egghead usually does somewhat better in the caucuses, even if the insider almost always wins the nomination. But is that a reason for disbanding caucuses? The real test of any nominating system is not whether it's "fairer" or allows greater participation or is more representative or promotes community or protects the secret ballot or anything else. It's whether it produces better nominees than other nominating systems. Keep in mind that of the six Democratic contests I mentioned above, the insider got nominated every time but only won the general election twice. So, would getting rid of caucuses produce higher quality nominees? I have no idea. Your thoughts?